Here at DataLabel, we manufacture a variety of waterproof labels, specially designed for the toughest of applications and harshest of environments. You can choose from a range of material including Polypropylene, Polyester or Vinyl which can withstand temperatures of between -40C to +140C our waterproof labels are built to last. Our waterproof labels can be used for a multitude of indoor or outdoor scenarios, places where humidity and dampness are a factor including refrigerators and freezers. They will not fade or degrade over time like other types of labels, and are provided on rolls for ease of use. You can also choose between gloss or matt finishes and all our labels can be manufactured with either a permanent or removable adhesive. Polypropylene is waterproof and is highly resistant to oils and chemicals, making it the perfect choice for use in outdoor applications, or where there is a prolonged exposure to water. 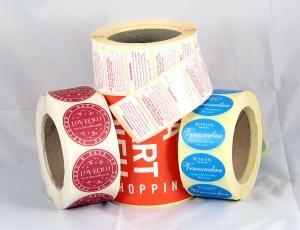 These labels are also perfect to use where there is contact with foodstuff or drink as they do not stain. Polyester is waterproof and can withstand harsh environments including extreme heat or cold. Polyester is also highly resistant to Ultraviolet light, making it particularly good at protecting colour and text from fading. Polyester labels are strong and durable, able to be submerged in water without coming away and are predominantly resistant to scratching and scuffing; this makes them ideal for industrial applications. Vinyl is a synthetic material that is well suited to extreme weather conditions including heat and cold, humidity and damp. It is use in many applications such as horticultural sectors and is ideal for use in marine and underwater environments. All of our waterproof labels are printed on the latest printers, using eco-friendly inks which are specially designed to resist fading and UV radiation making them strong and durable in any situation. We can print your labels using your own supplied artwork, and we accept a range of formats such as EPS files, Adobe Illustrator, CorelDraw and high resolution JPG files. Our flexibility is key in providing our customers with the right product when they need it. With delivery times usually taking between 3-5 days, our clients will have their products in no time, however if you need something more urgent we can help. To talk through your requirements, call our expert customer care team on 01293 551520, or request a quote here.